A bit spicy, a bit sweet- just one right balanced homemade roasted tomato salsa recipe! Beautiful salsa dip for your corn or pita chips, easy to make and oh so easy to eat. Try it with friends when watching favorite sport! I would say you need to multiple the amount of salsa to please a big crowd. For a small family midday snack the amount is just fine. 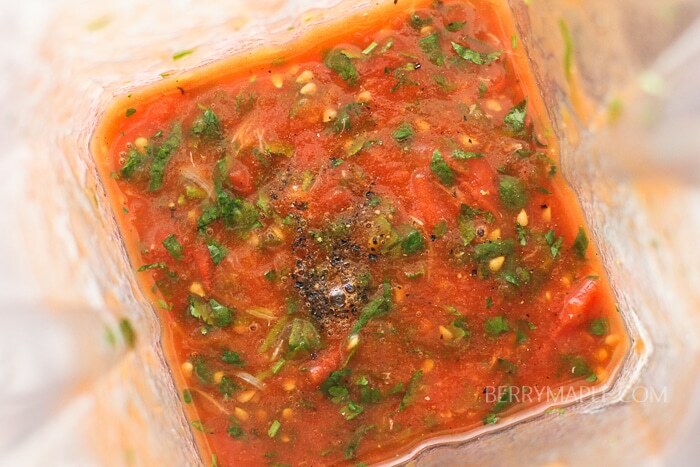 I prefer to make salsa in my Vitamix blender, but just about any blender will work! If you prefer a chunky style salsa, pulse it a few times and that’s it, no need to blend. A bit spicy, a bit sweet- just one right balanced homemade roasted tomatoes salsa recipe! Slice tomatoes in half and put it on the oven sheet along with garlic. Place chopped cilantro, lime juice , tomatoes and garlic in the blender and blend for a few seconds, until reaches desired consistency. Homemade salsa is always best. 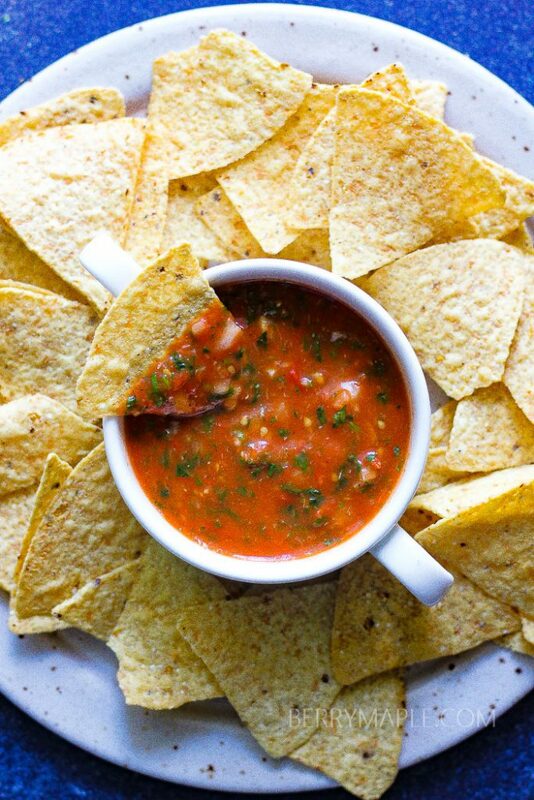 I never tried blender version of salsa, I need to try it, it will great with bowl of mulitgrain chips. We certainly do love our salsa but sometimes I get tired of all the chopping. Great idea to use your blender to make it quickly. Sometimes you just get the craving for salsa and chips, right? Will have to try this recipe out. I love homemade salsa! It looks very tasty. Is good food and this looks like one of the BEST! This is absolutely fantastic! I definitely want to try this and I’m sure it is very tasty! Thank you for sharing this great recipe. I have made only regular salsa but these roasted tomato salsa looks so delicious. Love the smokey flavor of the the roasted tomatoes. 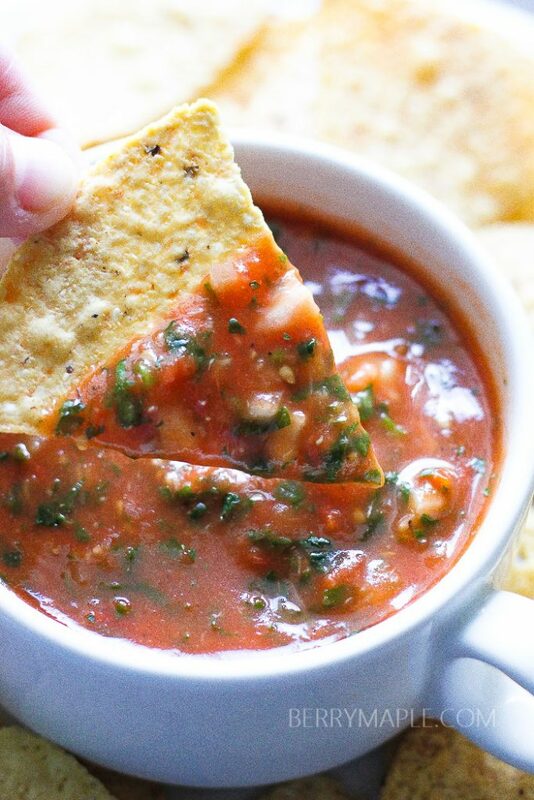 I love homemade salsa…when the ingredients are that fresh it can never be beaten. This looks so, so good…I could probably eat the whole bowl! 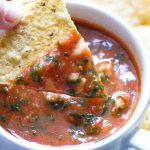 one of my favorite snacks is salsa and chips I love the freshness and this one looks over the top yummy and a must try! OH i am saving this for the summer time when we start to harvest our delicious Jersey fresh tomatoes! I never tried making salsa in the blender before! Mmmmmmm! Fresh salsa is the best and roasting the tomatoes has to add such a great layer of flavor. I can’t wait to get some chips and go to town! This salsa was great with fresh made corn chips!